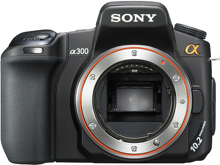 The Sony Alpha A300 DSLR (announced 30 January 2008) is a 10.2 megapixel DSLR. It features Sony’s new Quick AF Live View system which allows you to frame images in the camera’s 2.7 inch LCD yet still be able to focus images quickly. The LCD tilts up and down to allow you to view it from different angles. The Sony Alpha A300 DSLR shoots at up to 3 frames per second, and accepts Compact Flash media cards. It will ship with a DT 18-70mm f3.5-5.6 standard zoom lens for a retail price of around $800 USD. The Sony Alpha A300 will reach stores in April. This entry was posted in Sony and tagged Sony, Sony Alpha on March 10, 2008 by jonathanb.